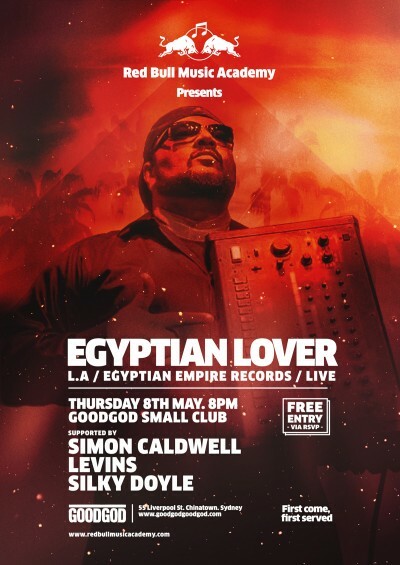 “What is a DJ if he can’t scratch?” was the question posed by Los Angeles-based beatmaker Egyptian Lover on his 1984 debut long-player. Thirty years later, hip-hop/electro fusionist Greg Broussard returns to Australia for Red Bull Music Academy to headline the May edition of its Club Night series. Last seen in Australia for Goodgod’s Vivid Live takeover in 2012, the 80s electro-funk legend returns to headline in our Danceteria, celebrating three decades of funk that will see an anthology released later this year on Stones Throw, as well as a new record in the wings. Before then, enjoy him for free, along with Sydney’s finest – Simon Caldwell, Levins and Silky Doyle. Entry by RSVP, entry subject to capacity… so be early!